One thousand years of history! Historic Travellers Rest, the 1799 home of Judge John Overton, is a prehistoric Native American village site and was the headquarters of the Army of Tennessee, December 1864. 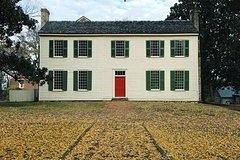 Located at 636 Farrell Parkway in Nashville Tennessee, meet your professional guide and tour the Historic Travellers Rest Plantation and Museum, one of the most unique homes in Nashville. Dating back to 1799, this plantation will allow you to step back in time and explore the plantation home of Judge John Overton as an advisor and close friend of Andrew Jackson, he was also the co-founder of Memphis Tennessee. Surrounded by a large herb garden with a one room school house, Smokehouse and weaving house,The Travellers Rest plantation preserves 200 years of Nashville's historic past, from frontier to Civil War to today. Travellers Rest really held true to it's name at that time by offering gracious southern hospitality to travelers passing through a land that had only recently been settled in those times. Tennessee was the Western frontier and Nashville was the place that settlers would come to make their fortune.